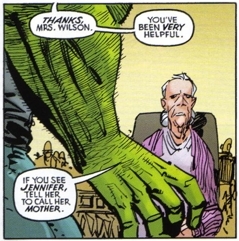 Mrs. Wilson is the elderly mother of Jennifer Dragon who lives in a retirement home in Baltimore, Maryland. Dragon only learned of the existence of Mrs. Wilson whilst he was on his global search for his missing wife. He had always believed Jennifer’s mother to be dead and was surprised to discover that not only was she alive but also that Jennifer had two previously unrevealed brothers. Dragon was unsure what to believe and the truth has still not been explained. She is later visited by her two sons who were once Bloop and Animal II, but had their powers negated. Mrs.Wilson now doing better with her medical issues is told that her daughter is dead, but the three decide to begin anew together.